If there is one word to describe Shane Victorino's 2010 season, it is different. .281 to .293 His average dropped 33 points, his OBP dropped 31 points, and his slugging and OPS dropped, but he set career highs in home runs, RBIs, and stolen bases. Let's look at this a little closer. Victorino's kept his average between .281 and .293 over the previous 4 seasons and was one of the most consistent performers, making his drop in average very strange. He ended up with career highs in homers and RBIs but his slugging percentage dropped 16 points, so I wouldn't consider that to be an increase in power. Come to think of it, Victorino had a poor season for a player with his skill set. In a lineup full of power hitters, the Phillies needed Victorino to get on base, steal bases, and score runs. He didn't provide many of those things and 18 homers means nothing with a lowly .429 slugging percentage. You can view all of Shane Victorino's career stats here. And for the last of the report cards for everyday players is the guy who won't be here anymore: Jayson Werth. Jayson Werth followed up a career year in 2009 with another pretty good season on paper in 2010. Werth finished with less home runs and RBIs in 2010, but nearly all of his other stats went up. His average increased 28 points, his OBP rose 15 points, his slugging improved by 26 points, and his OPS jumped 42 points. J-dub led the team in walks (82), runs (106), slugging percentage (.532), OPS (.921), and total bases (295). Even though he hit 7 less home runs, his power was not sacrificed as Werth hit 20 more doubles. And there is an easy explanation for why he finished with only 85 RBIs: runners in scoring position. Werth batted .186 with runners in scoring position as opposed to .279 the year before and finished with 14 less RBIs in 2010. If you added those 14 RBIs to his 2010 season and he would finish with exactly the same RBIs. Outside of his average with men on base, the other big knock is on his consistency. He had 13 HR and 47 RBIs in April through June, but then had just 6 home runs and 16 RBIs in July and August. Then he jumped up to 9 homers and 22 RBIs in September and August. Just how inconsistent is that? His 4 best months put him on pace for 35 homers and 111 RBIs, but his two worst months paced him for 18 homers and 47 RBIs. Looking back on it, Jayson Werth had a fantastic season. He hit with average, reached base a lot, hit with power, knocked in runs, and scored runs. I did not give him an A because he was inconsistent and didn't hit in clutch situations. Hopefully for the Nationals he plays a little differently next year. You can view all of Jayson Werth's career stats here. The Phillies bench played a big role in the 2010 season due to injuries to all regulars except Jayson Werth. Wilson Valdez carried the heaviest load, playing in 111 games, most of them as a starter. It is difficult to grade the bench because bench players are obviously there for a reason, but I guess the best word would be OK. The bench hit a combined .238, which isn't very good. But they did hit 36 home runs. They didn't have the Matt Stairs type long ball threat, but guys like Francisco, Dobbs, and Gload did have a little pop. Once again, the Phils bench lacked speed, which can be a very important attribute. 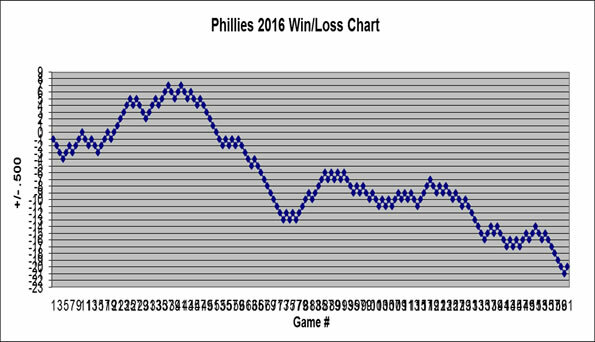 Considering the fact that the Phillies bench played a total of 125 more games and had 503 more plate appearances, they did alright. Regardless of any of the numbers, the ability of the bench to provide Valdez to fill in for Rollins the way he did is pretty good. We finally finished giving out the Phils Baseball reports cards to the offense and now we turn our attention to the pitchers. The first man on our list needs no introduction: it is Roy Halladay. Roy Halladay was pretty easy to grade. Halladay finished first in all of baseball in wins (21 - tied with Sabathia), innings (250.2), complete games (9), and shutouts (4). He also was fifth in the majors in ERA. And, oh yeah, he received his second Cy Young award. Added to that was a perfect game and the second no-hitter in postseason history. As good as 21 wins sounds, if Halladay had even adequate run support he could have easily had 3 or 4 more wins. The Phillies scored 2 runs or less in 11 of his 33 starts, a full third of the games he pitched. In those games Halladay had a 1.74 ERA. The Phils scored 1 run or less in 8 of his games and no runs at all in 3 of them. Roy Halladay was the best pitcher in baseball in 2010, evidenced by his Cy Young award. Halladay kept the team in almost all of his games and finished what he started many times. When Ruben Amaro brought Roy Halladay to the Phillies, he essentially told us that Halladay was a full step above Cliff Lee. I found it hard to believe at first, but Doc proved he was the best of the best. You can view all of Roy Halladay's career stats here. Cole Hamels had his best year as a professional in 2010 and it is such a shame that nobody noticed. His struggles in 2009 were very well documented. After his amazing postseason run in 2008, Hamels arrived the next season unprepared and not in pitching shape. He also lost his composure on numerous occasions when things did not go his way. In just one year, fans were prepared to crucify Hamels for one bad season. What did Cole Hamels decide to do? He worked out more intensely over the winter and developed a cutter. As he continued to refine his cutter, he pitched poorly in April and had a 5.28 ERA. Fans were all over Cole, but he didn't say a word and kept working. When he started to dominate, he didn't shove it in our faces. And when the team wasn't scoring runs for him he never complained and maintained his composure all year. As well as Hamels pitched in 2008, he was equally as good in 2010. He finished with his best season ERA (3.09) and most strikeouts (211). He also threw over 200 innings for the second time in his career (208.2). Hamels only finished with a 12-11 record, but that is a remarkable number since the Phillies scored 2 runs or less for him in 11 out of his 33 games (exactly one third of his starts). In the 15 games in which Hamels gave up between 2 and 4 runs, he only had 4 wins. What Hamels did to turn around a terrible 2009 season was extremely impressive.. He quietly became the ace-type pitcher he was in the past. Without his improvements over the year before, the Phillies probably would not have made the playoffs. You can view all of Cole Hamel's career stats here. 2010 was not a good year for big Joe Blanton. He started out the season by missing his first 5 games due to injury. When he returned, Blanton carried a 5.86 ERA through July. He turned it around a bit, posting a 3.23 ERA in the last two months. His late surge wasn't enough to salvage a season gone bad. Most of his numbers are not too far off his career averages, but he gave up more runs. It's not like we expected too much from Blanton, but he certainly had a disspointing season. The Phillies signed Blanton to a three-year, $24 million deal as a supposed number three starter, but he pitched more like a 4 or a 5. In a normal season Joe Blanton will have an ERA close to 4.00, so 4.82 isn't far off the pace if you consider it in those terms. You can view all of Joe Blanton's career stats here. Ed Wade gave the Phillies fans a nice present when he gave us Roy Oswalt and ate $11 million dollars of Oswalt's salary. And what a pleasant surprise he was! After his losing his very first game with the Phils, Oswalt did not lose a single game. He finished with a 7-1 record and a 1.74 ERA in his 13 games with the Phillies. Oswalt pitched so well that he was actually the best pitcher down the stretch while Halladay was getting tired. Oswalt was so effective because he kept runners off base. He led the team with a WHIP of .895 thanks to a only 2.3 walks per nine innings and an obscene 5.8 hits per nine. Let's face it, at the time we got Oswalt we knew he was just a consolation prize for losing Cliff Lee over the offseason. But Oswalt was anything but a second rate pitcher. Oswalt gave us everything he had and was a crucial factor in overcoming the Atlanta Braves. You can view all of Roy Oswalt's career stats here. Kyle Kendrick did the best he could with what he had. That is the best way I can describe Kendrick's season. After barely sniffing the majors the previous year, Kendrick was well aware that he could only come back to the Phillies if he developed another pitch. He worked on a cutter all through the 2009 season and in the 2010 offseason. He also arrived to spring training in good shape. Following Halladay's example, Kendrick followed Halladay around, developed his work routine, and even beat Doc to the facility some mornings. Having said that, Kendrick wasn't able to get everything to go on all cylinders. He was also extremely streaky. Kendrick allowed 1 run or less in 12 of his 31 starts, but gave up 5 runs or more in 10 of his starts. Kendrick's biggest problem was that he gave up over a hit per inning (9.9 per nine innings) and wasn't able to get a strikeout when he needed it (only 4.2 strikeouts per game). He had great movement most days, but he seemed to have difficutly controlling his movement and pitches would run right over the plate. That led to some big innings. An ERA below 5 is not too bad for a fifth starter, and Kendrick earned the right to compete again for a job in 2011. Kendrick showed many shines of flash in 2010, and he could become a decent pitcher if he can learn how to become more consistent. You can view all of Kyle Kendrick's career stats here.